Ornamental grasses can be grown and enjoyed across Florida if the proper species are selected that are well suited to the soils and climate. Those that are clumping in habit and do not self-seed into the native landscape are sound choices to diminish the number of invasive plant species already inflicting the state. Cut back foliage of grass clumps each late winter to ensure attractive, lush growth annually. Ornamental grass is a term loosely giving to grasses that are attractive and not used as mown turf or lawn grasses. Ornamental grasses include true grasses, those in the family Poaceae, including bamboo, but can also include grasslike plants like sedges (Carex spp. ), flax (Phormium spp.) and others (Lomandra sp., Dianella sp.). Florida has a warm temperate to subtropical climate from north to south respectively. While winters can be warm with occasional nighttime frosts, they are mild. The growing seasons are very long and the summers are hot and humid, punctuated with increased rainfall from thunderstorms and tropical storms or hurricanes from June to November. Generally speaking, Floridian soils are sandy and are nutrient-poor but high in phosphorus. Soils, from the shallow ones around Miami to the sandy loams in Central Florida and loam-clay in the Panhandle, are improved with addition of organic matter. Ornamental grasses tolerate many different soil conditions with their fibrous roots and typical tolerances of drought, but different plant species adapt better to the different soils and climate across the state. Tall grasses with attractive foliage or seed heads exist that are native to Florida, and thus well adapted naturally to the soils and climate. Muhly grass (Muhlenbergia capillaris), love grass (Eragrostis elliottii), grama grass (Tripsacum floridana) and Fakahatchee grass (Tripsacum dactyloides) are just a few species with clumping, noninvasive habits that add beauty to a Florida garden without lots of fertilizers or excess care. The oppressive humidity and repeated deluges of rain in summer can cause many common ornamental grasses popular elsewhere in the U.S. to rot or flop in Florida. 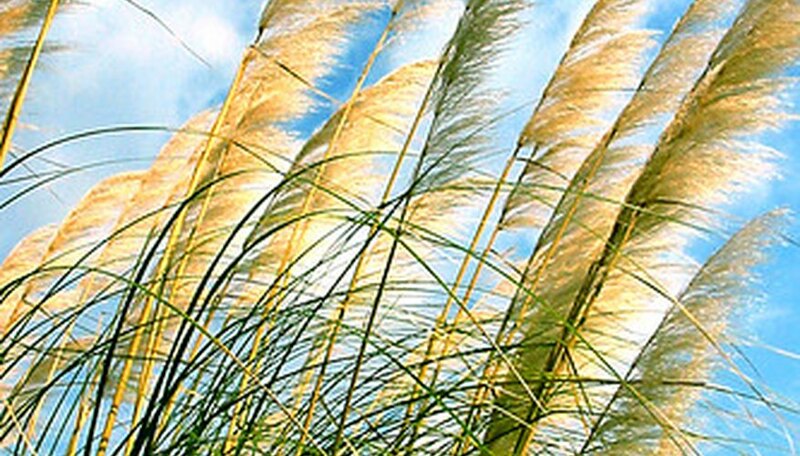 Exotic grasses, or those not native to Florida, can still be used. Japanese silver grass (Miscanthus spp.) has a tendency to get sooty mold in summertime, but cultivars like "Adagio" and "Cabaret" have proven very useful in Central Florida landscapes. Other grass species and varieties may be favored in different parts of the state and thus be used more frequently in gardens or more readily found at plant nurseries. Sugarcane (Saccharum spp. ), fountain grass (Pennisetum spp.) and lemon grass (Cymbogon citratus) are a few other exotic species worth investigating. Grasses go through flushes of growth, often slowing and browning foliage in winter, even in warm areas of Florida. It is recommended that dried or waning foliage of all ornamental grasses be cut back in late winter across the state to allow for attractive, fresh blades of grass to renew from March forward. The mild climate of Florida also means that some grass species' seeds readily germinate, causing displacement of less aggressive, native grasses and wildflowers. Always ask nursery employees or your cooperative extension office for guidance in avoiding exotic ornamental grasses that are known to seed and become weedy, such as some species of Pennisetum. Bamboo species can be grown in Florida, primarily more tropical types that are clumping. Avoid planting spreading, aggressive bamboo types, such as Phyllostachys. What Is the Meaning of Exotic Species?